If you want to create a private sanctuary right in your backyard, one of your first investments should be an outdoor spa. You’ll be able to relax after a long workday with a glass of wine, spend a romantic evening with your significant other and have the best backyard parties in town. If you like the idea of adding such a feature to your property, here’s how you can create the perfect outdoor spa. If you’re planning on creating your new outdoor spa on your wooden deck, just make sure it can handle the extra weight. It’s better to reinforce the structure than to have to excavate your spa once it sinks. An average outdoor spa weights around 5,500 pounds (with water and people) so make sure your deck load capacity can take it. You can also paint your deck with waterproof sealers to protect the wood from water damage and allow easier cleaning and maintenance. Once you exit your spa, you’ll want a soft space to dry and just soak up the sun. Sun loungers next to your tub will provide you with a comfy place to rest that’s luxurious but inexpensive. Certainly, the center stage of your outdoor spa retreat should belong to your spa module. 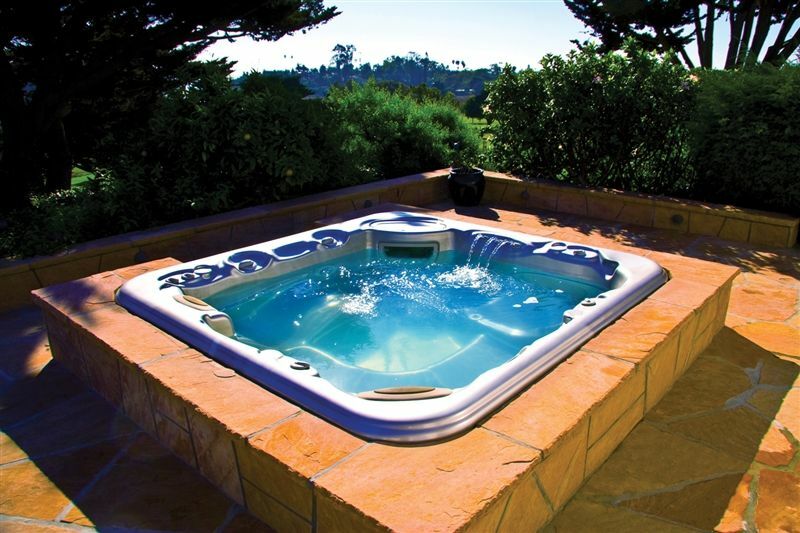 They come in many sizes and with a variety of massage jets, seating options and tub colors, so you’re bound to find a beautiful luxury spa model that fits both your needs and your budget. Contrary to what most people think, you don’t need that much space in your backyard: 2-seater spas take very little space but offer plenty in return. Every outdoor spa needs a touch of nature. Greenery around your spa will not only improve the look of your backyard but also provide you with some extra privacy. Large shrubs and flowers can stop the prying eyes and serve as a pop of color for your backyard. If you can, opt for greenery that has fragrant flowers (think jasmine, sensation lilac or gardenia) that will fill your spa area with a lovely, relaxing aroma. You will want to use your beautiful spa at night too, so make sure to provide it with appropriate lighting. To achieve a dramatic and interesting atmosphere you can use spotlights to illuminate your landscaping or use solar lights to create a soft and romantic ambience. Most spa models have built-in lighting, but you also want to illuminate the area around it for safety reasons. One of the most recognizable parts of every spa experience is soothing music. Today, there are products specifically designed for outdoor use, such as waterproof and floating speakers and music players. They will help create just the right atmosphere and keep you and your guests entertained. If you want to be able to enjoy your outdoor spa in all weather conditions, you should install a covering such as a wooden gazebo or pergola. These structures come in all sizes, shapes and price ranges, so you’ll surely find something that will meet all your needs. You can also install some outdoor blinds on your gazebo. It will provide you with extra protection and privacy. If you have enough room and extra money in the bank, you can install a small addition to your spa. For instance, a waterproof shed or changing rooms next to your spa will come in super handy for storing towels, accessories and bathing suits. If you follow these design and building tips you’ll create a luxurious outdoor spa to adorn your backyard and provide you with many hours of relaxation and fun.